I'd like to take a moment before we dive into the interview proper to make an announcement. This is the final Baker's Dozen I'll be contributing to WorldFamousComics.com. Doing this column for WFC has been a blast, and a really rewarding experience. Justin has been absolutely wonderful to work with, and become a truly good friend, to boot. To say that I'm grateful for this soapbox that he's provided for me and the many fine folks I've talked with over the years is a gross understatement. I'm rarely at a loss for words, but at this point a simple but heartfelt "Thanks, J!" will have to suffice. Despite all that, it's time to shake things up a bit. As regular readers might have noticed, this year has been one of marked changes for me, professionally. I've launched my own imprint, BBP Press, and an accompanying website--www.BillBakerPresents.com--and released my first self published book [Going with the Flow: Ron Garney on Creating Comics and Storytelling]. Currently, I'm working on the next installment of the Bill Baker Presents... series of interview books, and talking with a variety of editors about releasing comics-related books under their imprints, and I'm also discussing contributing work to a variety of magazines with their editors. After giving serious consideration to all those developments, and knowing that there are more to come, it's quite clear that I'm in the process of a major redefinition, career-wise. It also became evident that I needed to further refine my public image, or to put it in current business/marketing slang, I need to "consolidate the Bill Baker brand." Sadly, part of this professional rebirth requires that I end the current incarnation of Baker's Dozen here. But that doesn't mean that the Baker's Dozen is coming to an end. Rather, it marks the end of one era and the start of a new one for the column. Beginning this September, a new interview with the movers and the shakers, the rising stars and the living legends of comics, film, literature and the larger Pop Culture world will be posted every other Wednesday on my new website, www.BillBakerPresents.com. There are a lot of interesting folks doing some engrossing, even inspiring work in a wide variety of field, and I relish the opportunity to introduce you to them and their ideas. As for those readers who might wonder if these changes of venue and focus herald the end of my coverage of comics, please rest assured that nothing could be further from the truth. Instead, I hope you'll see it as I do-the inevitable outcome of a greater acceptance of comics as an art unto itself. For, just as the sequential narrative has been recognized as both literature and as a legitimate part of the larger entertainment complex, the rest of the arts are increasingly adopting and reflecting the particular sensibilities and devices of the comics medium in some interesting and often surprising ways. As Will Eisner observed a few years ago, we're in a true Golden Age of comics right now. And I wouldn't miss a moment of it-or the opportunity to share its wonders with you-for the world. I've two things to say before we get to my final column here. First, I'd like to thank Justin one last time for his unflagging support for my work. And, second, I'd like to thank you, the reader, for taking the time to check out what my guests and I have had to say for the past six years. Quite simply, without you, neither Baker's Dozen nor my larger body of work would exist. With all the hoopla surrounding the Eisner Awards for the best comics of the previous year during the annual Comic Con International-San Diego, it's easy to overlook another, rather important trophy-the Will Eisner Spirit of Comics Retailer Award, which is presented to the most outstanding comic shop of the year. And that's a real shame, as the various comic shops operating across this country and overseas are, in so many ways, vitally important to the continued health and growth of the medium. This year's Spirit of Comics award proved of particular interest to me personally, as a very good friend of mine, Wayne Wise, happens to be the manager of one of the shops nominated, namely Phantom of the Attic. I've known Wayne for nearly a decade now, having been introduced to him by the Strumhaus gang of comic creators while attending my first Pittsburgh Comic Con at the very start of my journalism career. And I've known Jeff Yandora, the owner of the Phantom, for as long as I've known Mr. Wise, having talked with Jeff length while checking out his selection of books during those my various visits to the Pittsburgh con. Given all that, I thought it was a perfect time to ask these two gents about the store's nomination for the 2009 Spirit of Comics Award, what putting together a proper submission packet entailed, and the various steps they've taken to create not just an exceptional comics shop, but also one which has weathered all kinds of economic storms. Bill Baker: Please correct me if I'm wrong, but this is the first year you've entered the Spirit of Comics award, isn't it? What prompted that decision? Wayne Wise: We moved to a much larger space a year ago and put a tremendous time and effort into the design and implementation. After two years in business we are finally in a space that physically complements what we have always been. We didn't really enter as a store, but I not-so-subtly hinted to our customers about the nomination and they stepped up to plate big-time. A lot of them sent in nominations. Jeff Yandora: Yes, this is our first year entering the competition; our entry is a product of our customers' enthusiasm for our store. We have always had great customers! BB: So, who took charge of putting together the entry package? BB: Well Wayne, how much work went into your entry? Was it a relatively simple process, or were you a bit surprised at how much work was involved in creating your submission? Wayne: I was surprised. I really had no idea what I was getting us into. They asked for a pretty thorough documentation packet and a five-minute video about the store. I kind of went overboard with the presentation, but I think we sent a really professional-looking package that highlights the best features of our store. BB: Were there any other surprises while going through that process? For instance, did you discover something about the store while creating the presentation that you'd not really noticed before? Wayne: We've been discovering new stuff all year as we adapt to the new routines and options we now have. We're better than I thought with the community outreach stuff. We do so many little things all the time that we don't even think of it in those terms until called on to list them. Jeff: We didn't get any real surprises while creating the presentation, but the modular format of the store always gives us new ideas all of the time. We are still getting used to the space after being in a much smaller location before. BB: What's the history of the store? How and when did it all get started, who has been the driving force behind it over the years, and what kind of customer base does it serve? Wayne: Phantom of the Attic opened in 1983. In 1990, Jeff bought the business; he was and is still remains the primary force of the business. We are sandwiched between the University of Pittsburgh and Carnegie Mellon University in a high-traffic professional section of the city. Our store shares a street with restaurants, coffee shops, independent book and music stores, and other specialty shops. The Carnegie Museum and Library are next door. While we serve a wide variety of interests, we have always viewed ourselves as a primarily a bookstore. Our customers are primarily readers who are constantly interested in new material. Jeff: As Wayne said, after being the store manager for five years, I purchased the Oakland location in 1990 and we have been here ever since. We have always had a reader customer base that has a wide variety of interests. Our customers have made our store. BB: Now, does all that mean that you folks only stock comics, and ignore games and cards and such? Wayne: Comics have always been the primary focus of our store, though we stock all of the other merchandise associated with this business and make every effort to get whatever our customers want. 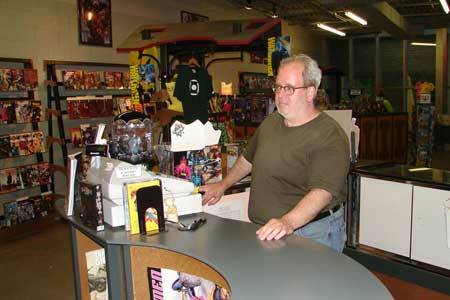 Over ten years ago we split our store into a comics shop and a game store to accommodate those different hobbies. In recent years we have experienced a dramatic shift away from back issues to the trade paperback/graphic novel format. Our college age demographic is barely aware of the concept of back issues, and the new customer base we see coming into the store are already familiar and comfortable with the bookstore metaphor. It seems like that format is the direction the new customer base is headed and we have designed our current business model around that idea. Jeff: Comics are still our forefront, but our graphic novels have been a quickly growing category for many years. We still carry back issue comics, but as graphic novel sales increase back issue sales have retreated greatly. Graphic novels are the new back issues. BB: How big of an effect has that trend had upon what you folks order for the shelf? Wayne: We have definitely increased the graphic novel selection-though we have been on top of that trend for quite some time now. Where we used to order new comics with the idea of having a percentage of them left over for back issues, we now trim our orders pretty tightly. We sell more copies of things like Fables or Walking Dead, over time, in trade paperback format than we do of the original issues. Jeff: Without a doubt, the concept of the graphic novel affects how we carry new comics, handle reorders of new comics, and conceptualize our back issue department. The rise of the graphic novel is the single most important change to our business in the last ten years. BB: Have you noticed any increase in traffic, and new faces, due to Hollywood's continued love affair with adapting comics to film? Wayne: Some. Watchmen was huge, of course, but then Watchmen has been a best-selling trade paperback for us for twenty years now. The Batman films renewed interest in the character and perennial favorites like Killing Joke and Dark Knight Returns went up for awhile. But really, movies like Spider-Man or Iron Man don't bring in throngs of new fans. That's true in general, I think. Jeff: I think that its impact has been raising general awareness of the comics genre, which is good for us and the industry as a whole. BB: What about Manga and the rising interest in that kind of storytelling? What kind of effect has that had on your choices of what to keep in stock? Wayne: We've stocked Manga since it first started appearing here in the 80s from publishers like First and Viz. Currently, with the explosion of popularity and the ready availability of Manga in retail chains like Borders and Barnes and Noble, we try to be smart with our choices. While we try to keep up with what is current, we don't stock everything, partly due to issues of space-there are a lot of volumes of Ranma 1/2, for instance-and partly because the primary demographic for much of the current Manga is not our primary customer base. We'll get it if a customer wants it, though. Jeff: Manga has always been a popular product line for us, but competition with large bookstore chains, and where the targeted demographic shops for it, has been problematic. I would say that manga has been less important for us in recent years, but we are still very interested in carrying what our immediate customer base is interested in, along with any stand out items. BB: Pittsburgh is situated in what has been famously referred to as the "American Rust Belt," and was subjected to some real economic hardships in the past. What steps, if any, did you take to ride those downturns out in the past? And what effect has the current state of the economy had on the store and its day-to-day operations? Wayne: I've read articles recently that indicate that Pittsburgh is weathering the current crisis better than many other areas. Most people here seem to believe that Pittsburgh has already survived the worst that can happen. At one time our economy was based to a large degree on the steel industry. Some say that the city has never completely recovered from its collapse. In many ways, the current crisis is business as usual around here. That's not to say we haven't felt the pinch at all, but the people here have learned how to be frugal and not to panic. It's a relatively inexpensive city to live in and we still have a tremendous amount of culture and diversity. Pittsburgh regularly shows up on those "Most Livable City" lists and there are many good reasons for that. As to how the store has weathered the ups and downs, I think the best answer is that we have always relied on promoting good product and building loyal, long-term readership instead of hitching our wagons to current hot fads. Comics were essentially born in the Depression and have historically done well in down times. In spite of recent price hikes it is still a relatively cheap hobby. Jeff: We have really continued a "business as usual" stance here from the beginning. Customers here are interested in getting their weekly comics and maybe some other things. Higher ticket priced items have always been a tough sell. Since last September we have had additional problem of a customer base that were beginning to lose jobs, having cuts in their hours and other financial woes. Things have gotten better slowly, but it has been difficult. I'm looking forward to getting things back to usual, sales-wise, which I think will come over time. BB: What effect has the nomination had on the store, if any? Have you seen any increased interest or, ideally, traffic? Wayne: Not a lot as of yet. The official announcement of the nomination just showed up online yesterday (Note: This interview took place on 7-15-09), so while we have talked about it in the store and created some online buzz among our regular customers, no one else has really heard much about it yet. We'll see what happens as this plays out. Jeff: There has been strong interest in the customers who know of the nomination, and as awareness grows, so does the interest. People seem genuinely excited about the store's involvement in the award process. BB: What keeps you doing all the work required to keep the store running at its best? And what do you get from all that effort? Wayne: When I was a wee lad I read comics pretty much in a vacuum. None of my friends were into this thing I loved. I would have thought I was in Heaven if there had been a place to share this hobby. Providing that place for others is a big motivator for me personally. Each of the employees of Phantom brings a very different skill set to the equation. I don't want to speak for them, but I do think each of us feels a tremendous loyalty to the business-and to our boss, Jeff, personally. I can't say enough good things about him and the work atmosphere he has created over the years. Jeff: My ace staff makes the store run at its best, and knowing we get the job done as right as we can is what we are interested in. Our staff has always been amazing! BB: What do you hope your customers get from frequenting Phantom of The Attic? Is it just about putting comics in their hands, or do you perhaps hope that they take a little more from their experience shopping with you? Wayne: There are a number of things I hope our customers get from Phantom. First, there is the obvious-simple good service. We should do our best to provide them with the merchandise they want. But a big part of our mission statement is to promote this hobby as art and literature. Building an appreciation for the amazing history of this art form, exposing people to new works, expanding the appreciation of a wide variety of styles available; these are all part of what we do. Phantom is a community as well. This is a place where people can share their hobby with others in ways most of them can't with their co-workers or families. Not only do they build relationships with us, but I've seen the development of strong friendships between people who have met in our store. We facilitate connections. It's a hobby that feeds the imagination and our store should be a place that accommodates that. It sounds almost silly to say it, but comics bring genuine joy to people. We try to remember, when we are tired and have spent too many hours unpacking boxes and bagging comics and restocking back issues from the warehouse, that we sell dreams. And really, how cool is that? Jeff: We have always been interested in providing a retail environment that embraces all forms of comic art and writing to its fullest. The enthusiasm of our staff and customers made us the store we are today! BB: Anything else you'd like to add before I let you two get back to work? file:///Users/justinuser1/Desktop/columns/BD/image/JeffatPhantomCounter.jpg Wayne: I want to say thanks to our customers. When the Eisner nomination process began online a tremendous number of them jumped in and submitted our name, and though I haven't read the vast majority of their comments, the ones I did were flattering and humbling. We have somehow created a loyal and vocal community, which in itself says we're doing something right. We couldn't do it without them. Jeff: Thanks for the interview and the interest in our current nomination state. 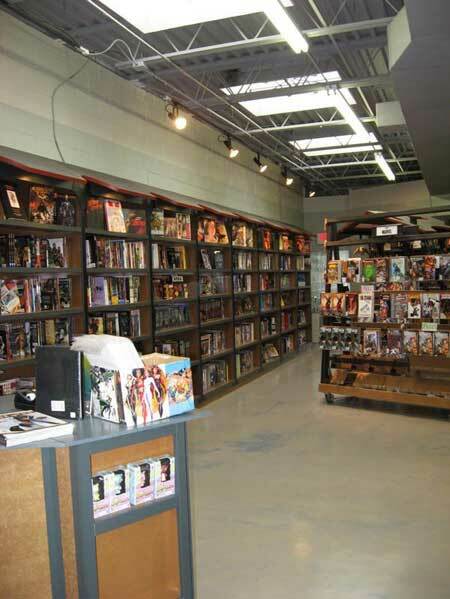 We look forward to furthering the comics genre in our new location. BB: It's my pleasure, Jeff. While Phantom didn't win this year's Will Eisner Spirit of Comics award, Jeff and Wayne enjoyed a truly great time attending this year's Comic Con International-San Diego and the awards ceremony. They also plan to continue to strive to perfect their store, and keep the spirit of comics alive in Pittsburgh. Finally, if you'd like to learn more about Wayne Wise and his creative endeavors, head over to his website at: http://www.wayne-wise.com/. Finally, check out the new Baker's Dozen column every other Wednesday at www.BillBakerPresents.com, beginning in September, 2009.